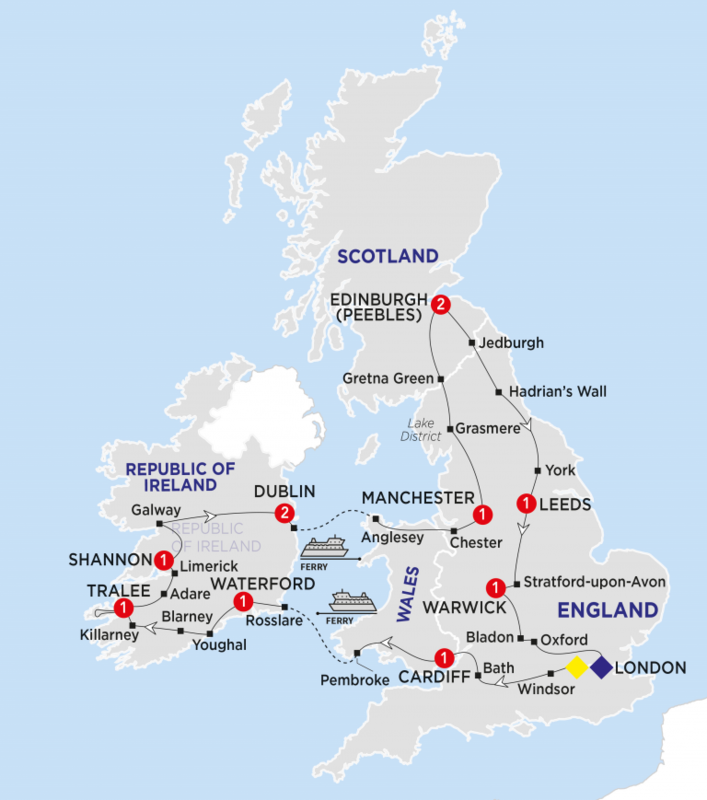 An all encompassing tour of England, Wales, Scotland and Ireland. Take in spectacular scenery, picturesque villages, impressive architecture and cities that are steeped in captivating history. This breathtaking tour will provide you with a lifetime of memories. This morning meet your Travel Director and travelling companions as you set off on your holiday. Visit Windsor and see the impressive castle rumoured to be the Queen’s favourite residence. Next we visit the Georgian city of Bath with it’s magnificent architecture. Then we cross the vast Severn Estuary to Cardiff, capital of Wales, where you dine tonight. Admire Cardiff Castle then journey through stunning countryside via Carmarthen. View Pembroke Castle which is the birthplace of Henry Vll, founder of the Tudor Dynasty. Board your ferry from Pembroke to Rosslare, Ireland. Journey west to Waterford and dine tonight at your hotel. You’ll explore this unique castle on a private tour and hear tales about the eclectic refurbishments. Done in the 1800s by architect William Burgess, his influences included Islamic art, Hans Christian Anderson’s fairy tales and even Aesop’s fables. You’ll also walk on the battlements and climb the 900-year-old Norman keep for superb views over Cardiff. Visit the Waterford Crystal Showroom. Continue along the beautiful southern Irish coast through the picturesque fishing port of Youghal. Explore Blarney Castle – kiss the stone and acquire the ‘gift of the gab’. Cross over the Cork and the Kerry Mountains, then travel via Killarney to your hotel in Tralee. This morning enjoy a scenic drive along the Dingle Peninsula. See the unspoilt and colourful villages and fishing harbours of Ireland’s most westerly point. Travel north to County Limerick through Adare, the prettiest village in Ireland. Arrive in Limerick where you view St. Mary’s Cathedral and King John’s Castle. This morning there is time to visit Bunratty Castle and folk park, where 19th century life is vividly recreated. Drive through beautiful County Clare to Galway. View the cathedral before heading across lush countryside to Dublin, Ireland’s capital. Tonight why not join your travelling companions for an Irish Cabaret? Come on a visit to the 15th-century Bunratty Castle and admire its fine furnishings, antiques and paintings. With your local specialist, you’ll experience an Ireland of the past, as you wander through the folk park with its thatched cottages and smoky turf fires. In the village, we’ll have free time to explore the quaint shops and relax in the local tea room. Your local specialist will take you on a panoramic sightseeing tour of the city with views of some of Dublin’s famous landmarks including; Trinity College, Dublin Castle and St Patrick’s Cathedral. You will then have free time to explore the city as you wish. Come to one of Dublin’s most locally-loved restaurant-pubs. You’ll enjoy dinner and charming hospitality that this part of the world is renowned for. Travel across the Irish Sea with superb views of Dublin Bay and arrive at Holyhead on the Welsh Island of Anglesey. Cameras at the ready as you view the station with one of the longest names in the world; Llanfairpwllgwyngyllgogerychwyrndrobwllllantysiliogogogoch. Enjoy the scenery of the north coast of Wales on the way to Chester, where you have time to walk along the medieval walls and appreciate the famous ‘Chester Rows’. Arrive later in Manchester. Stop to view William Wordsworth’s grave in the picturesque Lake District village of Grasmere. Travel across the Scottish border and stop at Gretna Green, where eloping couples could marry against their parents’ wishes. Your day ends at your hotel near Edinburgh. Tonight why not attend a lively Scottish banquet with traditional haggis and bagpipes? Enjoy an exclusive cruise on a private boat on England’s most beautiful and largest lake, taking in the northern coastline, beautiful houses, gardens and Wray Castle. You’ll see deserted islands, boats and birdlife as you explore the area loved by Beatrix Potter and William Wordsworth. Enjoy a sightseeing tour with your Local Specialist including views of the Georgian New Town, Palace of Holyroodhouse, the Royal Mile and Edinburgh Castle. Spend free time exploring on your own or join your Travel Director on an Optional Experience to the Royal Yacht Britannia in nearby Leith. During the Festival, tickets to the spectacular Edinburgh Tattoo are included. Tonight is your chance to put on that tartan and join us for an evening of singing, dancing and bagpipe playing at an internationally famous venue. You’ll enjoy delicious food and wine, join in the singing and watch a Highland dance or two. There’s even a chance to sample Scotland’s national dish – haggis. Dominating the skyline of the city, Edinburgh Castle has been on Castle Rock in one form or another since the 12th century. The site was a royal residence until 1633 and was then used for mostly military purposes. Famous for being the most besieged place in Great Britain and one of the most attacked in the world, historians have identified 26 sieges in its 1100-year-old history. We’ll also see the Scottish regalia, known as the Honours of Scotland and the National War Museum of Scotland. Travel south through the Scottish Borderlands and stop to admire the ruins of Jedburgh Abbey. Enjoy the views across the Cheviot Hills at Carter Bar and continue into Northumberland National Park where you see the Roman Hadrian’s Wall at Heddon. Cross the River Tyne at Newcastle and stop at York for an orientation tour including the Gothic Minster and the narrow cobbled street known as the Shambles. Then continue to your hotel in Leeds. Dine tonight at your hotel. Visit Stratford-upon-Avon, birthplace of Sir William Shakespeare, you will have time to see the sights including Anne Hathaway’s cottage. You’ll visit the magnificent State Apartments, see the wax-works, explore the exhibitions and climb Guy and Caesar’s Towers for panoramic views – before visiting the Gaol. You may even get to see the firing of the greatest of medieval siege weapons, the Trebuchet. ‘The Castle Dungeon’ is a separate experience and not included. Enjoy a scenic drive through the stunningly beautiful Cotswolds to the little churchyard in Bladon, where Sir Winston Churchill is buried. See the sights of Oxford, the oldest university city in England, before continuing to London where you can say farewell to your Travel Director and travelling companions at the end of your memorable holiday.